So… here’s the dilemma. You have your heart set on a new beautiful bedroom suite and you have found the perfect bedspread and matching draperies. As luck would have it, you even found the perfect Persian rug to match. The only problem is, before your new furniture is delivered and the accessories added into the mix, you need to add a fresh coat of paint to the bedroom. While it is always safe to go with a neutral color, there is the temptation to “go just a little wild and crazy” and add a splash of color. The added splash of color may take the form of an accent wall or focal wall, a look that is trending now and has been for a few years. But how do you incorporate an accent color to the room without making it look too busy or gawdy? If you are going to take all the trouble to create a bedroom that fits you to a “T”, you should carefully choose the wall color or colors as they will be around for a long time. Since a neutral palette has been trending for several years, it is up to you to create another complementary color or an accent color to offset that neutral color and add a little interest and/or pizzazz to keep the room from becoming too staid and boring. It is easy to find a neutral color that works… sure pastels like pretty pinks or soft blues or even shades of lilac and lavender work well for wall colors and are easy to pair up with flowery accessories. You can keep it simple and add artwork, vases or furniture all in one color and let your personality shine through with a few splashes of color here and there in a whimsical way. Therefore, the easiest way to do this is with an accent or focal wall. This wall is usually, but not always, found behind the bed headboard and that wall is painted in a moderately contrasting color. Immediately your eye is drawn to this wall and the neutral-toned walls just blend into the background. The accent or focal wall may be used for a striking piece of artwork, a collage of pictures or a series of shelves with personal mementoes. Some ideas for great color combos would be: gray and black or cream and taupe. That is keeping it simple… for starters anyway. 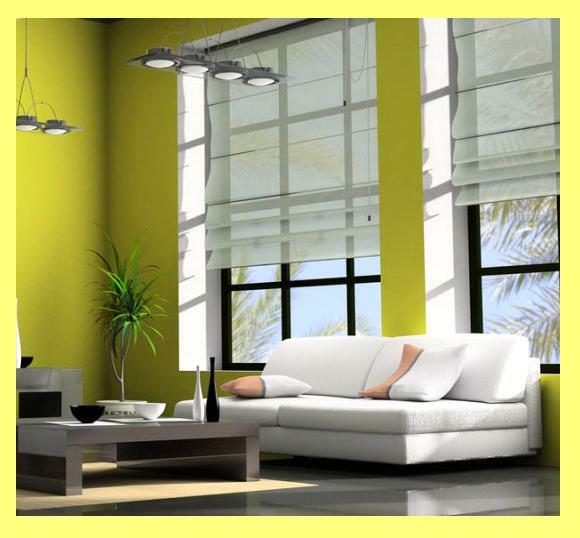 Add a splash of color in mango or bright yellow to pair with lighter, cream or eggshell-colored walls. Go a little tropical for interest and intrigue. You know that designers often suggest using a different type of material, not just color, for your accent or focal wall. Why not try a patterned wallpaper that harmonizes with the new wall color, yet gives interest and design to the wall? You can also use wood paneling for a different effect, though it may be thought of as a more masculine, rather than feminine, look. Wood paneling would look just as stunning with a wooden headboard as a softly upholstered headboard which is the same color as the wall coloring or something bright and vibrant. 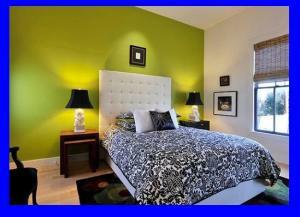 You may think that the neutral-colored walls need to have a vibrant accent color to complement them. This is not always true. You can use a neutral palette such as light gray, and go just a smidge of a shade darker for the focal or accent wall. That looks rich, pleasing to the eye and then you can go with jazzed-up accessories. Just the contrast of lighter versus darker, without a vibrant color per se is enhanced by the use of soft lighting, especially if the lighting is trained onto the focal wall. That’s a different look if you are leery to go too vibrant with your accent wall. However, the trend today is away from lights… of course, you must use them after the sun goes down, but instead of lights to accentuate the room, the more trending look these days is the use of large windows, with sheer window treatments which make use of the sunny days to bring natural light into the room. The minimalist look in the bedroom. If you are striving to keep it simple, and, thus that is your reason for the neutral palette, then do that, but remember that the use of a focal wall can be utilized to turn that particular wall into a work of art. Use a striking accent color like black with dove gray walls. It is a simple color combo, yet looks rich and inviting and will be a cinch to accessorize with exquisite artwork, maybe even your own? Think of gray walls, a dark gray or black focal wall with an array of stunning black-and-white photographs on display. The easiest room makeover in the world is painting. You can pick a color, open the can and grab a brush and you’re on your way. But if you really want to end up with a professional-looking paint job in your bedroom, and bend the ear of someone who could counsel you on best color scenarios for the home, then you would be wise to consult with a residential painter in Bel Air. He or she can advise you on the best colors or color combos for your room, based on its shape and size based on years of expertise. So go ahead, get that new furniture and vibrant bedroom accessories then pick a paint that will create both a harmonious and a bold statement in your bedroom.